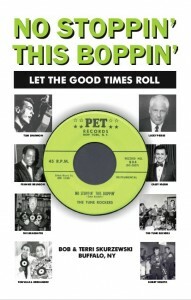 My friends, Bob and Terri Skurzewsk, have authored this wonderful book entitled “No Stoppin’ This Boppin’ – Let The Good Times Roll.” Their book examines the music scene in Buffalo from 1950 through 1964, when AM radio was king! Buffalo was home to many great DJs, and each interview in this book takes readers behind the scenes and shows how the broadcast industry worked, and how these DJs entertained with their on-air antics. If you would like updates on their publishing progress, visit their website on Facebook, www.facebook.com/NoStoppinThisBoppin/. Published by Visible Imagination Press, books can be purchased online at www.Amazon.com. Several local Buffalo bookstores and retailers also carry this title, including Talking Leaves, Dog Ears Bookstore, Vidler’s 5 & 10, Marilla Country Store and Rust Belt Books. It is also available at the Buffalo History Museum and Elma Museum. This entry was posted in General, Uncategorized on November 30, 2015 by Scott Jucha. 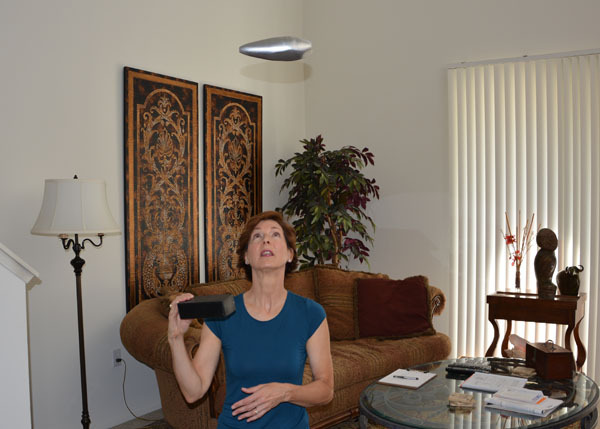 In collaboration with Melvin Industries, author S. H. Jucha commissioned the building of a model of a gravity-driven Silver Ship, otherwise known as a “dark traveler.” The above photo, shows the author’s wife demonstrating the ease with which the ship can be controlled. Disclaimer: This post, which is pure fiction, is meant to be a thank you to a group of very supportive readers of my novels, Dave Melvin, his wife Cindy, and his daughter Tiffany. Dave sent me the model on a whim, and I laughed saying that I had no individuals that small to fly it. Dave replied by sending me a remote controller, built with a “message in the bottle” so to speak. P.S. Dave, Peggy got a kick out of “flying” it. This entry was posted in Readers, Uncategorized on November 9, 2015 by Scott Jucha. I’ve been asked by several readers to post the Reddit Q&A session. So here you go! Hello, science fiction fans. 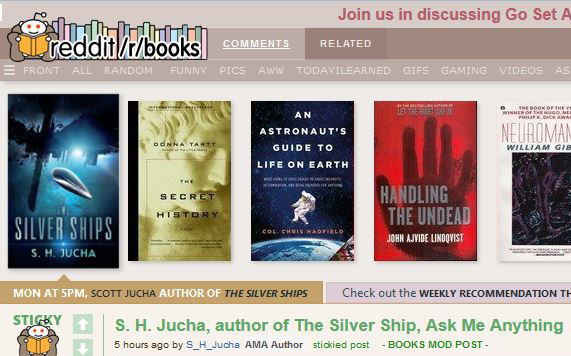 I’m S. H. Jucha, the author of the science fiction series, The Silver Ships. My first novel, The Silver Ships, was published in February 2015 and the second in the series, Libre, in July. Méridien, the conclusion to the trilogy will be available on November 1st. I have the audio book for The Silver Ships. When will LIBRE be available? I’m really looking forward to it – I have a trip coming up. There’s been a slight delay in the “Libre” audiobook, but it’s coming soon and the “Méridien” audiobook will follow shortly afterwards. Grover Gardner, who narrates the series, has had an impacted schedule lately so production has gotten behind. By the way, Grover, who narrated Stephen King’s “The Stand”, was nominated for a 2015 SOVAS award for his narration of “The Silver Ships”!